Have you ever wondered how money in circulation actually gets there? It’s a question I wondered a lot about when I was young. Nowadays, I know the answer and it’s still fascinating to see how billions of dollars in new money enter circulation so that you and I can spend it. One is the United States Mint, which makes the nation’s coins and has since 1792. The other is the United States Bureau of Engraving and Printing, which produces paper currency – you know $1 bills, $5 bills, etc. According to the Federal Reserve, there is approximately $1.6 trillion in coins and paper currency circulating right now. That’s a lot of dough! I’ve visited the Philadelphia Mint on several occasions — where I’ve seen the world’s largest minting facility strike millions of coins before my very eyes. Did You Know?… The Philadelphia Mint strikes coinage primarily for circulation east of the Mississippi River. The Denver Mint makes coins that circulate mainly out West. You, too, can tour the Philadelphia and Denver Mints. Believe me, it’s an awesome experience you won’t soon forget! Meanwhile, the United States Bureau of Engraving and Printing manufactures hundreds of millions of dollars of paper currency every day. You can take tours of the Federal Bureau of Engraving and Printing in Washington, D.C. and Fort Worth, Texas. 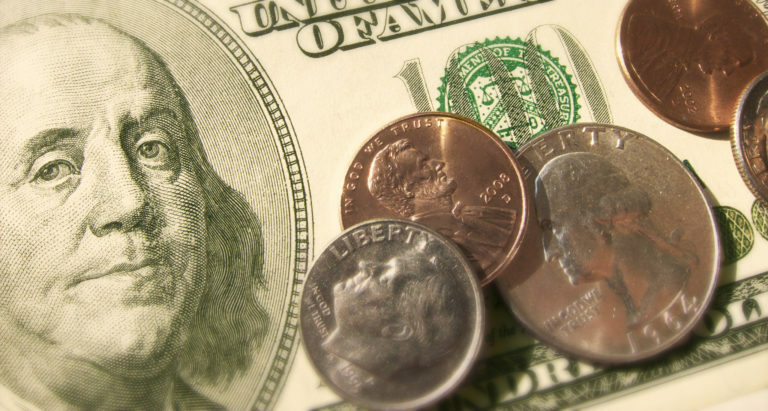 Fun Fact About American Currency: Coins spend an average of 25 to 30 years in circulation. Paper currency lasts between 4 years and 7 years, depending on the denomination. How Does Money Get Into Circulation? Money in circulation is a funny thing… I’m not talking about “funny money” – or “fake” bills! Nope, I mean that money is fickle. The Federal Reserve estimates demand for money rises and falls throughout the year on a seasonal basis — and even on different days of the week. For example, the Feds say more people withdraw cash from ATMs during the holiday season at the end of the year. Makes sense… I know I’ve spent tons of cash around Christmas and New Year’s Day. Here’s another interesting observation: people withdraw more cash from ATMs on weekends — meaning there’s more paper currency and coins in circulation on Mondays than on Fridays. Cool, huh? After coins are made at the United States Mint and paper currency is manufactured by the Federal Bureau of Engraving and Printing, they are (generally) shipped in armored vehicles to the 12 Federal Reserve Banks — which then distribute cash to banks and other depository institutions. However, there are some exceptions to how this American currency distribution process works. With U.S. paper currency, the Federal Reserve pays for only the cost of printing the money — which is about 5 to 12 cents per piece, depending on the denomination. With U.S. coins, which are an obligation of the United States Treasury, the Federal Reserve pays the face value of the coin. Another interesting exception is that some banks in various Federal Reserve districts subscribe to the United States Mint direct shipment program — which means the Mint sends new coins directly to the bank, bypassing the Federal Reserve in that process. So that how money in circulation gets there! Believe it or not you can track the dollar bills you spend — to see where they eventually end up. Puzzled, I looked up that URL to find a really cool currency tracking website called WheresGeorge.com. All I had to do was type in the dollar bill’s serial number, mention whether or not I still had the bill, add my current zipcode, and I could see where my dollar bill had traveled! It’s really cool to see where your dollar bills have been. With WheresGeorge.com, you can even enter information that records your encounter with the bill — which also helps other folks follow that same bill throughout the rest of its life in circulation. Unfortunately, there’s no way (yet) to track U.S. coins. So, for now, we can only imagine the wild adventures our coins have experienced! What Is Your Paper Money Worth? How Much Money Is In Circulation Right Now?